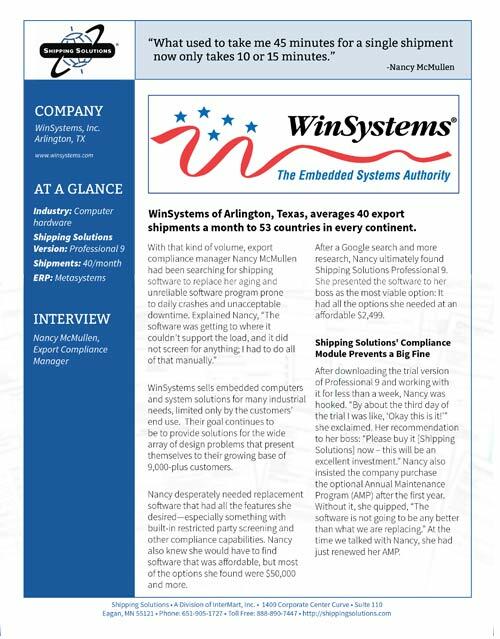 WinSystems of Arlington, Texas, averages 40 export shipments a month to 53 countries in every continent. 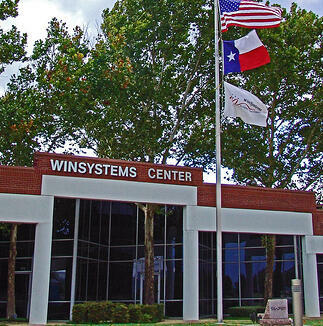 WinSystems sells embedded computers and system solutions for many industrial needs, limited only by the customers’ end use. Their goal continues to be to provide solutions for the wide array of design problems that present themselves to their growing base of 9,000-plus customers. Nancy desperately needed replacement software that had all the features she desired—especially something with built-in restricted party screening and other compliance capabilities. Nancy also knew she would have to find software that was affordable, but most of the options she found were $50,000 and more. After a Google search and more research, Nancy ultimately found Shipping Solutions Professional 9. She presented the software to her boss as the most viable option: It had all the options she needed at an affordable $2,499. After downloading the trial version of Professional 9 and working with it for less than a week, Nancy was hooked. “By about the third day of the trial I was like, ‘Okay this is it!’” she exclaimed. Her recommendation to her boss: “Please buy it [Shipping Solutions] now – this will be an excellent investment.” Nancy also insisted the company purchase the optional Annual Maintenance Program (AMP) after the first year. Without it, she quipped, “The software is not going to be any better than what we are replacing.” At the time we talked with Nancy, she had just renewed her AMP. “The money we spent to renew the AMP for Shipping Solutions probably just saved us 100 times that in a fine we could have incurred if the shipment had gone through,” she told her boss. “Having peace of mind is really awesome,” Nancy added. With up to 10 shipments a week or more, the time savings Nancy has realized with Shipping Solutions is significant. “What used to take me 45 minutes for a single shipment now only takes 10 or 15 minutes,” she observed. With the software’s database capabilities, she’s able to save shipments and part numbers easily. “For me to be able to go in, call up the part numbers, or simply copy a shipment, is a big time saver,” she explained. Most of her customers routinely ship to and bill to the same addresses, and have a set group of parts they order regularly. In addition to the time-saving features she uses every day, Nancy’s also looking forward to integrating the software’s other features into her workflow. She likes the feature that integrates Shipping Solutions with software used by both UPS and FedEx, two of WinSystems’ most used carriers. She’s also eager to integrate her company’s ERP (Enterprise Resource Planning) software with Shipping Solutions. Mastering the Data Exchange Manager—the tool that enables that function—could just be her next task. But in the meantime, “Without Shipping Solutions I can’t imagine exporting as frequently as we are because our international business has increased so much. Going through it [the process] manually the way we used to, with our current volume of shipping would be overwhelming,” she sighed.